The The WV Wage Payment and Collection Act is a general labor law poster poster by the West Virginia Division of Labor . This is a mandatory posting for all employers in West Virginia, and businesses who fail to comply may be subject to fines or sanctions. This poster must be posted in a conspicuous place by all employers so that all employees can see it. This poster describes how often employers must have paydays as well as when wages get paid in various circumstances and what employers cannot do with regard to their employees. WV All-In-One Labor Poster: Instead of printing out dozens of posters, employers can also purchase an all-in-one poster that covers both West Virginia and Federal poster requirements by clicking here . It appears you don't have a PDF plugin for this browser. Please see the link below to download west-virginia-wpc-poster.pdf. This abstract must be placed in an area accessible to all employees in accordance  with the  requirements of W. Va.
Pay employee wages at least twice a month, with no more than 19 days between paydays. with a bank convenient to the place of employment for employees to have immediate access to their wages. scheduled payday for all work he or she performed prior to his or her separation from employment. conditions of an employer -employee agreement, whether verbal or written, if any. regarding vacation, sick leave and other fringe benefits, if any . pay, fringe benefits, the time and place for meeting payroll, or any other existing terms or conditions of employment. Furnish each employee with a written itemized statement of deduct ions withheld from his or her wages each pay period. Selling goods or supplies to employees at prices higher than the current market value. the amount to be deducted, and state that 75% of the employee's net wages are exempt from assignment. Refusing to pay wages owed, up to $800.00, to the relatives of a deceased employee. There are an additional one optional and mandatory West Virginia labor law posters that may be relevant to your business. Be sure to also print all relevant state labor law posters, as well as all mandatory federal labor law posters. 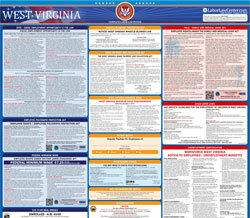 Instead of printing out pages of mandatory West Virginia and Federal labor law posters, you can purchase a professional, laminated all-in-one labor law poster that guarantees compliance with all West Virginia and federal posting requirements. Fully updated for 2019! While we do our best to keep our list of West Virginia labor law posters up to date and complete, we cannot be held liable for errors or omissions. Is the poster on this page out-of-date or not working? Please let us know and we will fix it ASAP. LaborPosters.org will email you a printable PDF of this West Virginia labor law poster, 100% FREE. You'll also get notified when new posters are available. This poster download is provided as-is, with no warranty or guarantees. Please verify with Federal and West Virginia authorities to confirm that you are posting all of the correct (and updated) posters required for your type of business. Instead of printing out pages of mandatory West Virginia and Federal labor law posters, you can purchase a professional, laminated all-in-one labor poster.